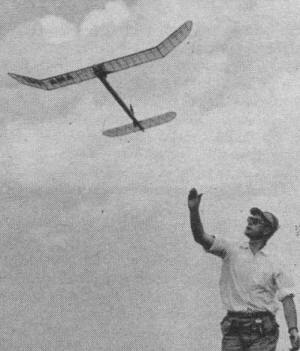 "Battling Bob" Hatschek reports here on the fly-off for top honors in representing the United States of America in the free flight World Championships. Events were held in California, Kansas, and Virginia. Categories included Wakefield rubber and Nordic towline glider. As is the case with all national and world championships, participation is based not only on model building and flying prowess, but on the ability to afford the time and money required to travel to many different venues along the way. It is rare to find a corporate or even private sponsor willing to foot the bill. 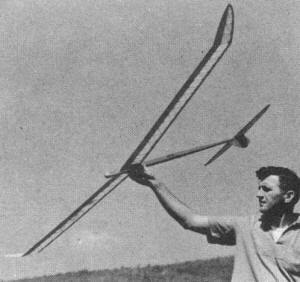 There many aeromodelers, however, that love the sport so much that they sacrifice much in order to advance the cause of the sport. There are no prizes to take home. Top man assumes a tremendous responsibility. Second place gets nothing. Most of the contestants have to drive many hundreds of miles to get there. Yet it's one of the top events in U.S. model aviation. And the nation's best free flighters try like the Dickens to qualify for it. This strange sounding meet is the "Semi-Final" for picking the members of the teams that will represent America in the World Championships. Actually three final meets staged at Fresno, California, Wichita, Kansas, and Richmond, Virginia, this year makes the Semi quite unique. It's sort of a combination fraternity meeting-technical convention-airplane contest. And it's great! Competition is the sharpest you'll find - because only the best have survived the elimination to enter. The relatively small number of flyers prevent the Semi from becoming a mad house. Everybody knows everybody else, or soon makes the acquaintance, and you know exactly where you stand throughout the competition. Nordic Class Towline Glider. Saturday was hot in Richmond with a breeze between 5 and 8 mph. Beautiful. Thermals were there to be found by the weather experts - but so were the downdrafts. 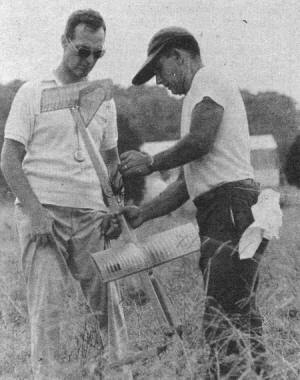 Only two fellows maxed in the first round, Ed Hopper from Baltimore and Bud Elston from Flint, Mich. Both dropped it the next round, Bud disastrously. Ohioan Mike Karlak took over top spot with a pair of near maxes. That set the tone for the day until the last round began with Hopper again in the lead. After his flight the tension mounted and all eyes turned toward Karlak and New Yorker Steve Kasprzak. Either of them could just top Hopper with a max. But rising air was scarce by now and neither made it. At Fresno, Hank Cole led the first round with 2:39 and held the lead for six rounds with Bill Langenberg 20 seconds behind, Norm Ingersoll in third and Joe Bilgri in fourth. Cole, Langenberg and Bilgri all had bad ones in the seventh, while Ingersoll maxed out for top spot. Winner in the Midwest was Art Frost of St. Louis. 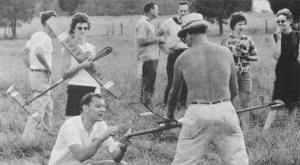 At Richmond USA-FAI Semi-Final's "Fly-Off", George Reich cranks turns into one of the jobs he used to win the '61 World Championships. Cannizzo feeds rubber into his "Langley", a Parmenter design from American Modeler, while helper searches pockets for pair of pliers. Country-club atmosphere prevails at Eastern qualifications to pick USA teams. Mrs. Crowley holds spare, hubby prepares his '62 Nats' 2nd placer. 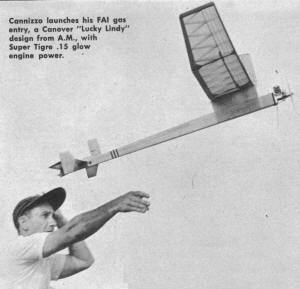 Cannizzo launches his FAI gas entry, a Conover "Lucky Lindy" design from American Modeler, with Super Tigre .15 glow engine power. Bob Wunchnic's "Noisy Nordic", A/2 towline design by Don Wensel. Fuse burns rubber, releases switch, turns on bike horn. This very attractive Nordic glider was one of the best at the Eastern "Semi" competition according to N.S.A. reporter Robert Hatschek. Crowley (left) congratulates Cannizzo after the battle is over. Other qualifying meets to pick USA's F/F-FAI reps were in California and Kansas. Wakefield Rubber Power. Eastern weather held the same for most of the second day and most of us eliminated ourselves by discovering dandy downdrafts or making other really brilliant errors. But not World Champ George Reich. 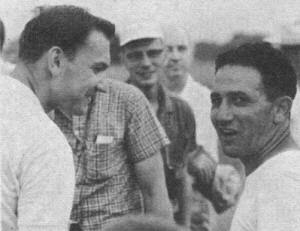 Nor his 1958 team mate Sal Cannizzo. Nor Detroiter Paul Crowley, who took second in Wakefield at the Nats. These three maxed all the way for perfect scores to put the event into a flyoff. This is always a tense point. And this time it was made more so by a 90 degree shift in the wind plus an increase in velocity to about 25 mph. They wound. One, two, three they launched. Cannizzo's 2:41 landed him on the 1963 team - and landed his ship more than a mile downwind. 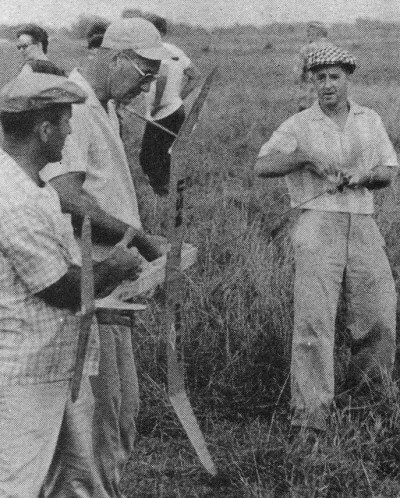 Out West Joe Bilgri, Carl Hermes, John Lenderman and Jim Patterson went six rounds with perfect scores. Bilgri dropped it in the seventh, Lenderman and Patterson in the eighth, leaving Hermes the only man with all maxes. Dave Kneeland, from Kansas City, was the top Wakefielder at Wichita - and we hear some tremendous raves for his ship and the way it flies. Free Flight Power. Sunday's wind shift brought rain on Monday - an on-again-off-again drizzle - to the East-Coasters. Then mercifully the wind dropped back to about 5 mph. Thermals and downdrafts were still to be found, but they were generally milder - and the cooler temperatures were almost a blessing after two days in the 90's. Going into the last round only one man had a perfect total. But the next dozen were breathing hot down his neck only seconds behind. It was as tense as any flyoff. And the weather wasn't helping. Then the leader maxed to make the team. It was Jim Warnock of Canton, Ohio. Except that the weather stayed at about the 100 degree mark, it was almost the same in California. One man strung all maxes together and was chased all the way through - but it's impossible to catch a leader who doesn't goof. Doug Galbreath was that fellow. 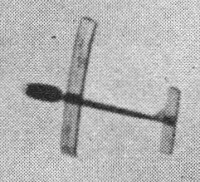 Cannizzo's rubber-powered "Langley" soaring overhead. All pix by Battling Bob. 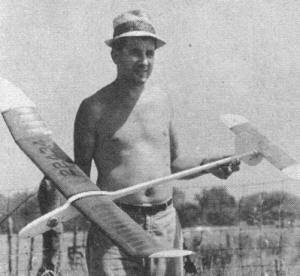 In the Midwest, Frank Spearman flew a high thrust design to top spot. There you have it. Those are the nine rubber-gas-powerless free flighters who will represent the U.S. at Wiener Neustadt, Austria, next year. All the Wakefielders have been on the team before. The others will be newcomers to World Championship competition. But in going through these Semi-Finals they proved they have what it takes. Best of luck, fellas, you've earned it! Noisy Nordic? Every meet we go to we see at least one very clever new idea. Best of the lot at the Semi-Finals was Bob Wuchnic's noisy Nordic - and we do mean loud. 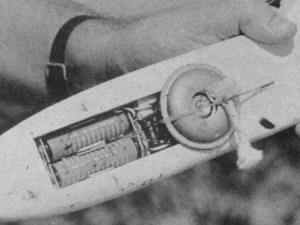 Part of the nose weight consisted of the works from a bicycle horn, a pair of penlight batteries and a fuse-triggered switch. Jes' great for finding the model in corn, wheat, woods, weeds, etc. See pix. F/F'er You Ought to Meet. Actually you really ought to meet all nine team flyers who proved they're the best - and the rest, too. But since this is a magazine, not an encyclopedia, and we have to single out just one, we pick Sal Cannizzo because he's a great all-around, free flighter and one of the nicest guys I have ever had the pleasure of being beaten by. (Ed. Note - that's ending a sentence with a losing proposition!) At 34, Sal's been building free flight for 24 years - good ones - and all kinds. He's a tough competitor in gas, towline, rubber, Jetex, indoor, anywhere. This year he qualified in both Wakefield and Nordic. but had tough luck with his Super Tigre powered Lucky Lindy. He's got the physical stamina to go with F/F, too. He's an ex-paratrooper. Nowadays he operates heavy construction machinery for the City of New York. And as a sideline he runs the New England Wakefield Supply, which he took over from Ed Dolby. This is a mail order house that specializes in Pirelli rubber, propeller shafts, aluminum wing tongues and many other odd items for these international class contenders. Cannizzo, an AMA Leader Member and Contest Director, is a mainstay of his club, the New Jersey Thunderbirds. This year he was also elected CD of the Greater New York Interclub Organization, a group of free flight clubs in the area. Now, when I say Sal is a nice guy, I'm not just making words. F'rinstance there was the time Sal voluntarily offered another power contestant a pint of special brew, the formula of which Sal got from a top modeler in Italy. I've seem him spend many an hour out in the boondocks helping somebody else to find a model. After the flyoff down in Richmond Sal didn't look as happy as you'd expect - and he worked hard to win it, remember. So I asked him if he felt okay. His answer? "Gee, Bob, I hate to beat those two guys. 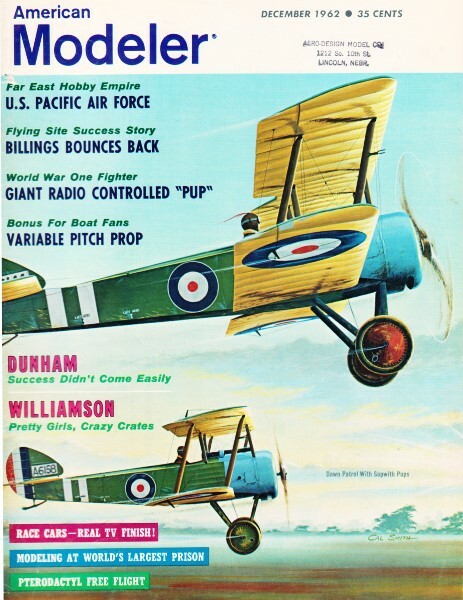 They're both great flyers."